"Live streaming technology isn’t new, but in the last few months we’ve been introduced to two new players in the live streaming market. 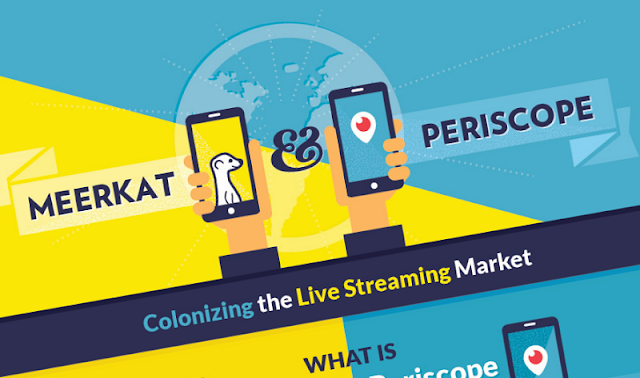 Meerkat and Periscope both allow users to share live-streamed video, and both received a ton of hype when they launched. Combined, these apps have seen more than 580,000 posts, 190,000 users, and 5 billion impressions. Beyond their similarities, these apps have some notable differences; for instance, Meerkat lacks the browsing capability for live streams that Periscope has, and it’s easier to save videos on Periscope." Take a look at this infographic, created by Salesforce, to learn more about how you can grow your social authority, brand awareness and reach with Meerkat and Periscope live stream videos.